Another great read by Richard Baldwin, this Michigan-based story takes place in Traverse City, one of Michigan’s more beautiful towns if you have never been there. I have seen some reviews to Mr. Baldwin’s books that are pretty harsh, critiquing the fact that the local police would never let a citizen assist in any cases, etc. etc. This story is fiction. Fiction. It is an easy read, and flows nice right from the beginning, to the middle, and the ending is something that you usually don’t expect or see ahead of time. 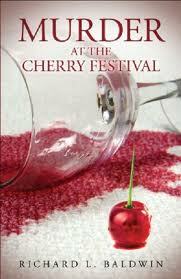 This story concerns the murder of Tom McNutt, Grand Marshal for the Cherry Festival, and winery owner with a score of enemies. There is one witness, a teenage girl, and a list of suspects as long as your arm. The descriptions are spot on, and the characters are well developed. There is nothing too complicated here, and is a good story to read on a cold and rainy weekend, which seems to be the current season in Michigan. This is the 3rd book by Mr. Baldwin that I have read, and I will definitely be getting more!